Monday was a bit of a late start for me to the conference but I went all caught up with emails, which is a good thing. 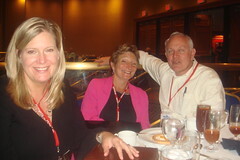 I heard Juan Williams’ keynote was excellent and the good news is Sally Falkow blogged it. I caught the tail end of Katie Paine’s blogs and social media measurement session and as always, she provided an abundance of information on all the things you can measure in the tricky space of social media. I know many search marketers will read that last sentence and think, “What’s tricky? Measure traffic and conversions!” which I can certainly relate to. The thing is, most companies do not engage PR firms for direct marketing and sales efforts, but for brand and reputation building. That’s not to say public relations efforts do not result in sales, because they certainly do. Social media is where the next generation of buyers are spending their time, so companies that want to stay ahead of the curve would do well to start figuring out their place in the channel now. Katie showed her company’s monitoring tool that tracks positive and negative “buzz” about companies online and I think many more of these kinds of tools will be developed to help companies better monitor the conversations about brands happening online. Afterwards I had a chance to talk with Jamie O’Donnell of SEO-PR. Contrary to my earlier speculation, Greg Jarboe was not on another Carribean island vacation, but in Toronto for SES. I was also able to meet Sarah Skerik from PR Newswire. Actually, we’d met virtually before on a tele-seminar for Bulldog Reporter, but this was in person. It was great to see a senior exec like Sarah so savvy in the ways of search optimization and public relations. 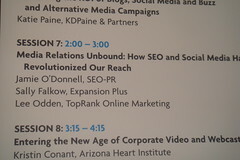 The SEO, Social Media and PR session with Sally Falkow, Jamie O’Donnell and myself ran from 2-3pm and it was packed. In fact, they had to bring in extra chairs. Jamie went first and I was interested to see “Push and Pull PR” as topics. Not that those topics are new, because they are not. Push and pull PR is a model I’ve been using since last year to describe how SEO and social media fit into new media public relations. I’m glad the idea is catching on with other companies that do SEO and public relations like we do. Jamie gave a great overview of the industry and a case study involving Harlequin, the romance novel publisher. I followed with a quick overview of Push PR as traditional outreach and Pull PR as search optimization. The topic of the session mentioned SEO specifically, so I spent quite a bit of time talking about SEO concepts and tactics along with specific examples of PR and social media content that can be optimized. Sally finished things off with more great insight on the opportunity with blogs and PR. She ended with a case study that showed how building buzz in the blogosphere actually created a market for her client and drove search queries. Pretty impressive. The conference organizers approached afterwards (later in the day) and said they’d received excellent feedback on the session. It’s always good to get that feedback right away. After a break I sat in on Debbie Weil’s session on corporate blogging and I’ll post that over at Media Relations Blog. I had a chance to say hi to Debbie and then went to the after conference networking event. 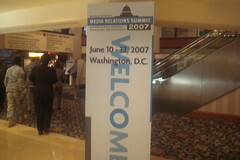 There I had the chance to meet more PR professionals in an hour than I’ve probably met in a few months. So many people in the PR industry are realizing the power of both search and social media, the thirst for knowledge is tremendous. 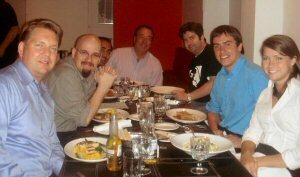 Paull Young from Converson pinged me about a geek dinner with Josh Hallett, Peter Himler from Flatiron, Phil Gomes from Edelman, Constantin Basturea from Converseon, Rohit Bhargava from Ogilvy, Edelman intern Ashley Imsand and possibly Rob Key from Converson. Rob was in Toronto for SES and was flying in to do sessions here on Tuesday. The dinner was excellent and conversation even better. Josh has some great photos on Flickr. The strangest of which, is me using a taser on Phil Gomes, except it’s not a taser, it’s a podcast recorder. Speaking of photos, my Sony Cybershot dropped in a glass of water at SES New York and came back to life only to be both washed AND dried stuck in cargo pocket of some shorts. After 4-5 days it came back to life AGAIN. I recharged the same battery and took several photos with it here at MR Summit. As you can tell, it’s time I get a new camera because this one doesn’t work so well. However, considering the beating it’s gone through, it’s doing pretty well. Good job Sony! During and after the geek dinner there were great stories from everyone including Phil Gomes about his world travels and time at Edelman and Peter Himler had some really great PR stories that you just don’t hear that often. It was amazing being able to have conversations with these veteran and highly respected public relations professionals. As I’ve said in posts and podcast interviews on conferences in the past, one of the best things (in both a productive and enjoyable way) about conferences is the networking. Great to share dinner with you Lee! I really enjoyed the conversation. Can’t believe your camera is still taking good pics after getting soaked! It was great finally meeting you (and the others). If things get too frigid in MN this winter, you’ll always have a place to crash in NY. Great meeting you Paull and Peter!